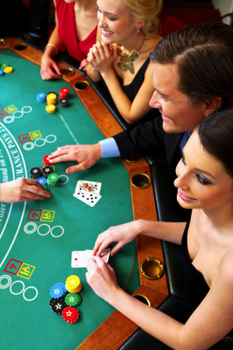 Upstate Vegas Events: Our Dealers teach you how to play casino games - Pai Gow. Pai Gow poker is an Americanized version of Pai Gow, which uses playing cards bearing poker hand values, instead of Pai Gow’s Chinese dominoes. The game uses a standard 52-card deck, plus a single joker. The game table will be set for six players, plus the dealer. Each player attempts to defeat the banker (who may be the casino dealer, or one of the other players at the table). Place your two hands on the table in their designated areas. The dealer will instruct you, if necessary. Wait for the dealer to separate her cards to see if you’ve won. The winning cards beat both the dealer’s five-card and two-card hands. Winning only one hand (which usually happens) results in a tie.